This section focuses on communities and development, including sustainable communities, smart growth, land use, regional planning, growth management, livable cities, and agricultural land protection. It includes articles, speeches, reports, interviews, book and anthology excerpts, PowerPoint presentations, and presentation transcripts. How we utilize land has a large impact on our collective environmental footprint. 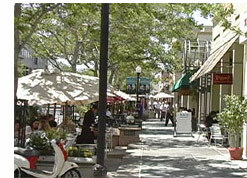 Smart growth contributes environmental, economic, fiscal, and social benefits through mixed use, pedestrian and mass transit orientation, and higher density buildings while preserving parks and open space. Sustainable communities can involve many diverse aspects, from designing spaces for community interaction to hosting local farmers markets. To manage growth for the greatest benefit, there must be coordinated local and regional planning efforts that ensure the implementation of compatible and responsible land use and transportation policies. Additional collections of articles on Land Use and Conserving the Built Environment issues are available from The EcoIQ Magazine here and here.